When there are no outside liberties, this eight-point large eye shape can be turned into seki or ko depending on how it is played. In this position a is the vital point. After , threatens to atari the white stone, (at ) forcing . then makes the position seki. Black can tenuki and then on its own also makes a seki. After , is dame. Under area scoring it is worth one point to the player who plays it. Under territory scoring it is no points for either player. Seki is the usual result, but there is a throw-in ko. 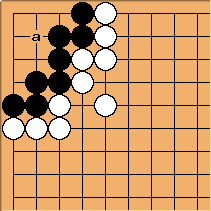 If Black is ko master than he can throw in a stone at and make a two-stage ko. Because Black needs two big ko threats more than White, this ko favors White, so Black will usually make seki. 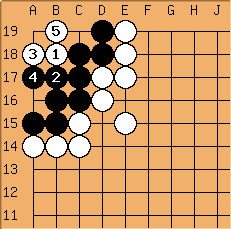 If Black plays elsewhere tenuki after in the first diagram, and White is ko master White can also make a two-stage ko. This is a more straightforward way of reaching seki. Here and are miai : / also reaches seki. As soon as there is an outside liberty, this shape is alive with 7 points. Thanks to the outside liberty, Black can atari at . Without that extra liberty, puts himself into atari. When the last outside liberty is taken, the play on the 2-2 is normally a 3 1/2 point gote (Miai Counting).